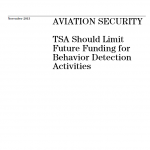 Available evidence does not support whether behavioral indicators, which are used in the Transportation Security Administration’s (TSA) Screening of Passengers by Observation Techniques (SPOT) program, can be used to identify persons who may pose a risk to aviation security. GAO reviewed four meta-analyses (reviews that analyze other studies and synthesize their findings) that included over 400 studies from the past 60 years and found that the human ability to accurately identify deceptive behavior based on behavioral indicators is the same as or slightly better than chance. Further, the Department of Homeland Security’s (DHS) April 2011 study conducted to validate SPOT’s behavioral indicators did not demonstrate their effectiveness because of study limitations, including the use of unreliable data. Twenty-one of the 25 behavior detection officers (BDO) GAO interviewed at four airports said that some behavioral indicators are subjective. TSA officials agree, and said they are working to better define them. GAO analyzed data from fiscal years 2011 and 2012 on the rates at which BDOs referred passengers for additional screening based on behavioral indicators and found that BDOs’ referral rates varied significantly across airports, raising questions about the use of behavioral indicators by BDOs. To help ensure consistency, TSA officials said they deployed teams nationally to verify compliance with SPOT procedures in August 2013. However, these teams are not designed to help ensure BDOs consistently interpret SPOT indicators. DHS Human Factors/Behavioral Sciences Division presentation on social network analysis, behavioral threat detection and biometrics programs as of May 2009. Overview presentation from 2007 regarding the Future Attribute Screening Technology Mobile Module (FAST M2), a system for identifying potential threats via behavioral analysis.